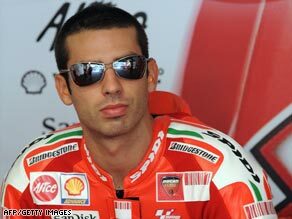 (CNN) -- Kawasaki have announced they will run Marco Melandri in a one-bike team in the 2009 MotoGP world championship. Italian Melandri will be the sole Kawasaki rider in the 2009 MotoGP championship. The news comes just weeks after the Japanese manufacturer confirmed it was to end its MotoGP activities due to the economic downturn. A statement confirmed the team's return to the sport comes in the wake of "constructive talks between Kawasaki, MotoGP organisers and other involved parties". "This decision was made after negotiations that followed Kawasaki's January 2009 announcement to suspend its MotoGP activities due to the economic crisis," the statement continued. "The rider for the new MotoGP team will be Marco Melandri. The team will be equipped with Kawasaki motorcycles and supporting materials. "That Kawasaki have come to this new team approach is the result of, on the one hand, the need for a strong reduction of MotoGP racing investments and, on the other hand, the necessity to come to constructive solutions for all related parties." Melandri moved to Kawasaki from Ducati at the end of what was a dismal 2008 season for the Italian, but shortly afterwards was told his new team would not be on the grid in 2009. While the 26-year-old has earned a welcome reprieve, the man who would have been Melandri's team-mate this season, American John Hopkins, appears set for an extended spell on the sidelines.